Film Camp 2014 — Watershed Productions Inc.
Three weeks of the Summer Film Camp has just wrapped up and there are now 48 more young filmmakers who have been super-charged and sent into the community with new filmmaking skills. We had many returning participants, including some 4, 5 and 6 year veterans of the film camp! The Senior Director’s Seat has made a tradition of screening their new films at the Civic on the last day of the program. This year, 11 proud young filmmakers screened to a friendly audience to great acclaim. Jason Asbell and Andrew Fry worked with these 14-18 year olds throughout the two-week intensive program, with Bryan Webb helping out during a few days of production. Lily Miller, James Tucker and Noah Gaffran were the recipients of the Kootenay Emerging Filmmaker Award made possible by a grant from the Osprey Community Foundation’s Arts Legacy Fund. These three youth received a full scholarship to attend the two-week intensive film camp and each will get further mentorship as they move forward in their filmmaking careers. See the Nelson Star article here. For the first time ever, we had a 6-7 year old program Production Crew. 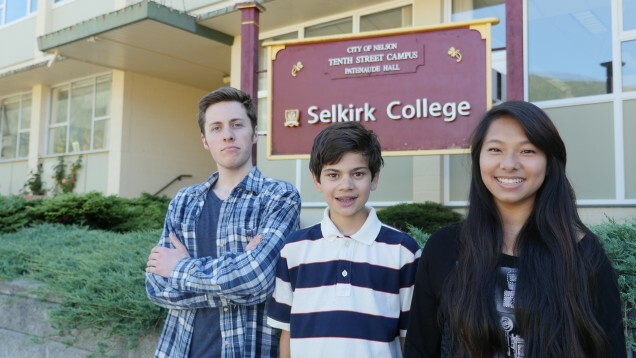 These little filmmakers had big heart and made three films in just 15 hours of film camp. The Junior Director’s Seat and Director’s Seat program saw 28 young filmmakers come to the 10th Street Campus where 11 films between 28 participants. Check out our Summer Film Camp Youtube Channel where you can see all the movies from this past summer and many of the ones we’ve made since the camp was founded in 2007. Posted on July 30, 2014	in Events, Filmmaking, Resource. Bookmark the permalink.